These days they call them inspiration boards, but I call them bulletin boards. I have always had more than one, even when I was in my teenage room and mostly tacking up pictures from Tiger Beat and Seventeen. Now at the age of 46 (well, 46 next week) I have many in my craft den and one big one in my bedroom. Sometimes I feel odd about that. Like I haven't grown up. But, as much as I love little pieces of paper and design, not to mention souvenirs - how could I not have several boards? I find even so many beautiful images on the internet. I mean it really is endless, isn't it? When I find something so beautiful or inspiring or stunning I want to save it, but often all I can do is just save the blog post or article. So, as you can imagine I was pretty happy to find Pinterest. 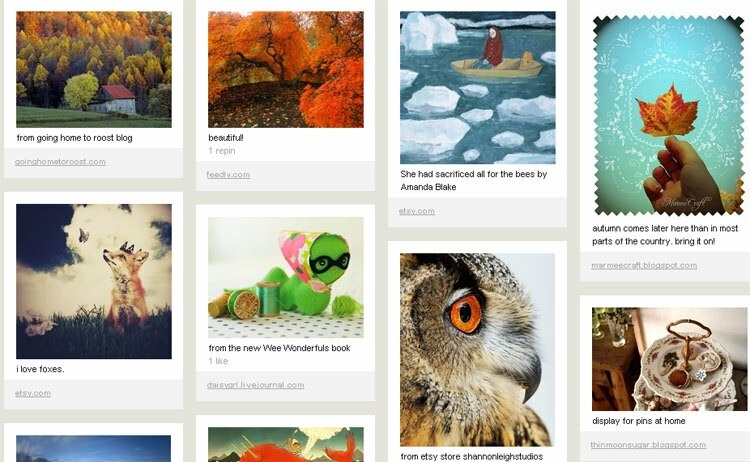 It's an online personal inspiration board and you can create many different boards. If you know how much I love a theme (and I kind of think you do) then you know how much I love that. You can also follow other people's boards and see what they are pinning. It's pretty great. The only thing that would make it better is if you could see a larger version of the image with just a hover over the pic. Maybe they are working on that. Above is a screen shot of one of my boards. You can see my boards here and follow me if you want. I don't have too many as I have just started. I really love the boards that my friend Jenny does. Maybe I'll see you on Pinterest. Looking forward to seeing your boards. Hi, I'm Paul and one of the founders of Pinterest. Thanks so much for the post, and we're really enjoying your pins + pinboards. If you ever have questions, comments or suggestions, drop me a note at paul [at] pinterest [dot] com. It would be awesome to hear from you. P.S. Your 'zines of house stories look really cool.